IMR is bringing out a new series of advanced-formulation extruded powders. In 2015, IMR will introduce three (3) new Enduron powders: IMR 4166, IMR 4451, and IMR 7977. The new line of IMR Enduron powders feature small kernels for easy metering, plus a built-in copper fouling eliminator. 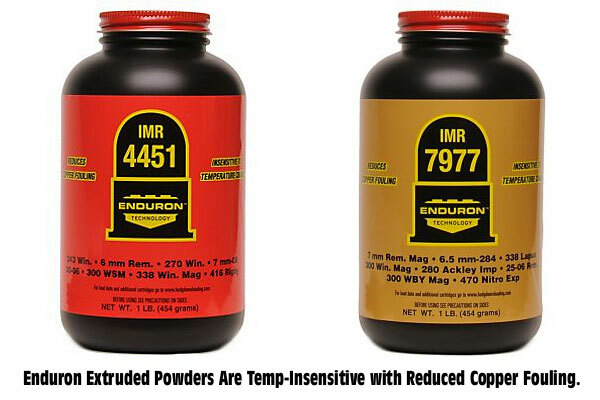 IMR claims that Enduron powders are not sensitive to temperature changes. If this is true, these powders should prove popular, particularly IMR 4166 which seems to be in the Varget/Reloder 15 burn-rate range. With Varget so hard to find, if IMR 4166 proves accurate (and available) we might see many .308 Win shooters make the switch. IMR states that IMR 4166 is a “versatile, match grade propellant”. We’ve been quite pleased with IMR 8208 XBR as a Varget alternative. IMR 8208 XBR is accurate, clean-burning, and offers good velocity. Perhaps the new IMR 4166 will be as good or better. When will Enduron powders appear on dealers’ shelves? Hodgdon Powder Co., distributors of Hodgdon, IMR, and Winchester powders, says that: “The new IMR Enduron™ Technology powders will be available at dealers in early 2015 in 1-pound and 8-pound containers.” For more information and Enduron LOAD DATA visit imrpowder.com or check the 2015 Hodgdon Annual Manual. IMR 4166 is the first in the series of Enduron™ propellants. It’s a perfect burn speed for cartridges like the 308 Win/7.62mm NATO, 22-250 Remington, 257 Roberts and dozens more. 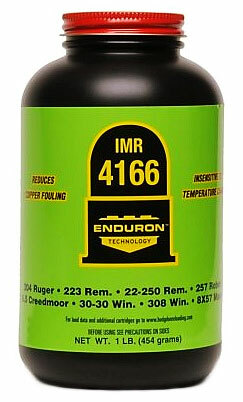 IMR 4451 Another new Enduron powder that gives top performance in the venerable .30-06, 270 Winchester, and 300 Winchester Short Magnum, to name just a few. This propellant is ideally suited for many mid-range burn speed cartridges. IMR 7977 is the slowest burn rate Enduron Technology powder. It is a true magnum cartridge propellant with outstanding performance in such cartridges as the .300 Winchester Magnum, 7mm Remington Magnum, .338 Lapua and more. Share the post "IMR Introduces New Enduron Powders: 4166, 4451, 7977"
This is great ! They are introducing more new powders, but are unable to supply powders that are heavily in demand, and have a proven track record over the years. Way to go: I can’t wait to try them all——NOT. IMR is probably the most available powder of all right how. 4064 ect. Yeah, I couldn’t get any H4831SC to save my life a few months ago, but could easily get my hands on 32lbs of a single lot of IMR7828SSC. On the IMR website, the only one they mention being fine grain is IMR 4166. By this, I hope they mean fine grain like Benchmark and H322. Those even run well through a progressive press. I’m a huge IMR 4831 fan for my 270 and other cartridges and would be willing to try 4451 if it becomes available. It looks like it may put up some impressive numbers. Have been using IMR8208XBR in an SDM AR15 clone with 77BTHP’s. The powder gave me the lowest ES/SD figures that I have ever experienced (with Rem 7-1/2 primers)in the 223Rem. Have shot it from 75-110F without issue. The powder seems to want to work best in the upper loads and gave me 2650fps from an 18″ barrel. I should also mention that the grains of IMR8208XBR are very, very small. All of my testing has been done with charges thrown via an RCBS powder thrower. This would be a great powder for a progressive setup for NMC, service rifle, etc. IMR 4166 is now available at certain retailers. I just ordered some. I seen (8)lber of 4166 on the shelf today locally. I come home and started the research on the Enduron powders. First I have heard of them. Editor: Hodgdon was kind enough to send us 2 lbs. for IMR 4166 for testing. We’ll try it out in a .308 and a 6mmBR after the holiday season. I have to agree with Grant…IMR8208XBR gives almost unbelievably low ES/SD on a consistent basis. I shoot it in my Hart barreled .22-250; the most consistent, temp-insensitive (on par with or better than Hodgdon Extreme line) powder I’ve ever used, and I’ve used them all. Based on that, I’ll most likely give these new powders a shot. Abram, The IMR site has data on 7977. Did you ever try out the IMR 4166 with the 6MM BR? I picked up a pound yesterday and wonder if I should try it in my BR or save it for the .243 and .308? Any load data would be welcome. Just bought two pounds for the 223. A little disappointed though as they advertise it as a (fine)?? powder but the graines are very large. Through my RCBS Uniflow measure it’s Crunch,Crunch. Will stick with IMR-8208 if I can ever find some!!!. I am doing some load development for IMR 4166 in the 6MM BR Norma caliber. I am happy to share what i have if you are interested and my results so far as accuracy is concerned. I do not as yet have any indication of the temperature variance but will include that as soon as testing progresses to that stage. with my savage 338 LM checking a load hornady brass with 95.0 gr of 7977 with a 250 gr sierra HPBT match. haven’t shot it yet this is a load that is worked up from a reloading book. wanting to see how it shoots. anyone else tried this load. if you have tried before let me know. Jerry- Yes please reply to me on your findings for use in the 6BR. I also got a LB of it, but my barrel won’t be in for another Month. Talked to a few guys that have tried it i the 6BR and so far they love it for Accuraccy. Just as I was starting to test loads for a 180 grain Cutting Edge MTH bullet in 300 mag I found a can of IMR 4451. My rifle,however, seemed to like H1000 the best of IMR 4831, IMR 7828, and IMR 4451. But more importantly is how can these companies come out with new powders when trying to buy standards like IMR 4350 are not available? That is why I was at my supplier in the first place. At my supplier I am seeing an increase in price so I wonder if this powder shortage is just until prices rise $4 a pound. Does anyone have any data on 7977 with a 264 win mag? Any idea when a replacement for 4759 will be available?